People on food stamps should be drug tested. If people worked harder we wouldn’t need welfare. If people really needed IDs they could get them easily. I work hard for my own stuff, why can’t they work hard for theirs? If people didn’t make bad decisions, they wouldn’t be poor. I wish these were statements I was making up. Unfortunately, I have heard all of them. And I don’t just mean I have seen them posted by often unnamed social media users. I have heard people say these things out loud. Now, there are going to be times when good people, well-intentioned people, disagree on issues. But I am not addressing that disagreement with this post. I want to address our attitudes towards poor people. Jesus said, “You will always have the poor with you,” and we have taken that and run with it. Since the poor will always be here, why should we worry about them? Since we will always have the poor, why should we think we could actually do something to stop it? Jesus was saying at a specific event at a specific time that having His body prepared for burial was a precious gift that should not be mocked. In John 12:1-8, Jesus is anointed with some expensive oil. Judas asks why the money was not spent on the poor. But John is quick to point out that Judas was not asking because of his concern for the poor; Judas was asking because he wanted to keep the money for himself. And Jesus did not say, “The poor will always be with you,” and leave it at that. He also added, “But I am about to leave.” Jesus knew His death was imminent and the anointing that He received prepared Him for His death, burial and resurrection. Unfortunately, too many of us have taken the first part of Jesus’ statement (The poor will always be with you) to excuse some pretty bad attitudes and behaviors towards poor people. If we can view the poor as “other,” as “them,” as moral failures, then we can justify in our own minds not doing more to help. We can rail against higher taxes and more government offices. We can call for stricter rules and regulations without considering the impact on those below middle class. We can scoff at increased minimum wages and protect the executives’ bottom line thinking they will share their wealth. But I have to ask: how should we be treating the poor? Not from a political policy perspective, but from the viewpoint of people who claim the name of Jesus as our identity, how should we treat the poor? Her medical condition caused her to lose her livelihood and her well-being, but all people noticed was that she was not clean. Since she was not clean it was okay that they disregarded her. Since she was not clean it was okay if no one helped her. Since she was not clean it was okay if she was not included in the crowd. Since she was not clean it was okay if no one noticed her. Since so many other people treated her as if she was garbage it made sense that she would think He would do so, as well. Since religious leaders and social elites would not welcome her it made sense she did not feel welcome when approaching Him. Since she was not clean it made sense that she tried to touch His cloak without Him noticing. After all, everyone else despised her. Why should she think He would be any different? But He was different. She grabbed the corner of His cloak believing that would be sufficient. She wanted to stay hidden. But He noticed. And He called out to find out who touched His cloak. Even when His followers scoffed at the idea He could notice one person’s touch among the multitudes He continued asking who touched His cloak. So she came forward. Afraid. Nervous. Scared about what might happen now. He did not see the unclean. He did not regard her as an outcast. He did not look past her because she did not have what the other person He was helping had. He saw her. And He called her daughter. Because when Jesus meets the poor, He sees daughters and sons of God. On January 14, 2004, I first admitted I had a drinking problem. More accurately, on January 14, 2004, I admitted I was drinking a lot. I didn’t think it was a problem. However, when I was woken up on the morning on January 15 by my wife, I finally realized I did, indeed, have a problem. On January 23, 2004, I attended my first meeting of Alcoholics Anonymous and identified myself as an alcoholic. We have lived in three states since then. I have attended meetings and developed a relationship with a sponsor in each one. I have attended meetings in places where I was just visiting for a day or two. I have since started attending and leading Celebrate Recovery meetings, as well. 12 Step support groups, especially AA, have provided me with resources and relationships that have been vital in my ongoing recovery from my addiction. This week, Gabrielle Glaser of the Atlantic released a scathing article about AA and its lack of scientific research. Shortly after, Jesse Singal of New York Magazine released an article critiquing the shortcomings of Glaser’s work. Glaser refers to scientific studies that, according to her, debunk the 12 Step model. Singal points out Glaser’s research is quite limited and even inconsistent. So one scientific article says 12 Steps are good; one says 12 Steps are bad. What is one to believe? These two articles have had me thinking: what is the point? Why have I continued to attend meetings? (Admittedly, my attendance has declined recently due to scheduling conflicts but I still attend periodically.) Why do I still identify as an alcoholic, albeit a recovering one? I have spent the last year writing about the 12 Steps and lessons churches can learn from groups such as AA. I stand behind all that I have said and written. But when a challenge arises, it does cause me to pause, step back, and ask myself if what I have believed, practiced, and encouraged for the past decade matters. Alcoholics Anonymous matters because it is one of the few places where people can go and admit their greatest faults, weaknesses, and failures and not be turned away. Alcoholics Anonymous matters because no matter how much science and medicine can develop, no pill can provide community. Alcoholics Anonymous matters because success is not measured in long-term sobriety; success is measured in the courage it takes to stand up and admit there is a problem. Alcoholics Anonymous matters because it recognizes each person is different, each story is unique, yet there is a common bond among all its members. Alcoholics Anonymous matters because everyone is welcome. Alcoholics Anonymous matters because it is not perfect, it is made up of imperfect people, and the suggested steps are not intended to bring about perfection; rather, the purpose of AA and the 12 Steps is progress—just move forward. I am not opposed to science. I welcome mental and physical health interventions that can help people who suffer from addictions. But no medical advance will remove the power and importance 12 Step groups have had, still have, and will continue to have. He came down from the mountain. Immediately the man was healed. The person no one would touch. And with good reason. There have been many reasons some have chosen to view others as untouchable. Not too many years ago, white people were taught to not touch black people—or even things they had touched. Today, many still feel touching an immigrant, or someone from a different religion, or a homeless person is too difficult. Just a few months ago, many in the country collectively lost their minds and did not want to touch anybody because 3 people in a nation of over 300 million were suffering with Ebola. But those are all crappy reasons to not touch someone. Jesus had a good reason. Leprosy could be contagious. Leprosy made you an outcast. Leprosy was a visible sign that separated you from the rest of the community. With all of His power, with all of the ways He could have healed, Jesus touched him. Pope Francis gets this. 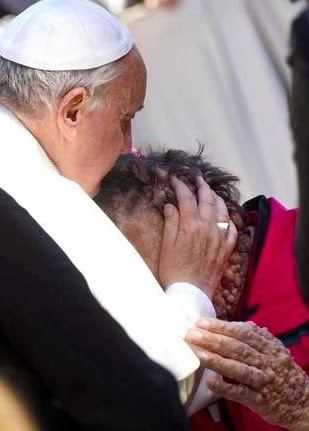 One of the greatest pictures I have ever seen is Pope Francis kissing a person with leprosy. 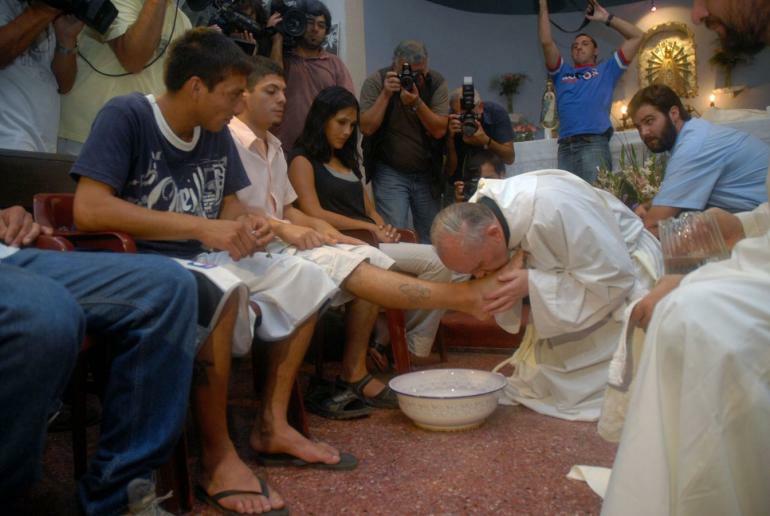 There is also the image of him washing and kissing the feet of Muslims. We have created so many categories of people we won’t touch. Those with certain health issues. Those from different economic classes. Those with different sexual orientations or gender assignments. People from different ethnicities. Those who attend church in different locations; or not at all. People who disagree with us. We keep adding and adding to the list of untouchables. And we don’t just avoid touching—we avoid any sign of support or encouragement. Because we fear that to speak up for someone who is untouchable is going to lead our privileged, comfortable friends to lump us into the same categories. What does this look like? It’s when we stay silent while our friends are insulting others. It’s when we laugh at the joke demeaning another because we don’t want to stand out from the crowd. It’s when we don’t share certain things in our social media feeds because we are afraid of what our family and friends might think. It’s when we look for churches made up of people who look, dress, and worship exactly like we do. Treating people like they are untouchable does not look like leper colonies being built outside of the city walls. Treating people like they are untouchable looks like building up barriers in our lives that keep those who are different out and those who we view as comfortable in. So break down the barriers. Are there Muslims in your community? Meet them. Talk with them. Invite them into your home and share a meal with them. Are there homeless people in your community? Pick them up in your car and take them out to eat. Don’t just deliver food and drop it off, but spend time with them. Talk to them. Find out what they need and see if you can partner with them in finding the necessary resources. Are there churches that are multi-ethnic in your community? If so, visit them. If not, make yours that way. Seek people from different backgrounds and invite them to worship with you. Are there places in your community that the respectable people dare not go? Then by all means—go there. Breaking down the barriers and touching the untouchable has to be intentional. It cannot happen by mistake.